The powers of government should be so divided and balanced among several bodies of magistracy, as that no one could transcend their legal limits, without being effectually checked and restrained by others. It should be our endeavor to cultivate the peace and friendship of every nation. There must doubtless be an unhappy inﬂuence on the manners of our people produced by the existence of slavery among us. The whole commerce between master and slave is a perpetual exercise of the most boisterous passions, the most unremitting despotism on the one part, and degrading submissions on the other. Our children see this, and learn to imitate it; for man is an imitative animal. This quality is the germ of all education in him. 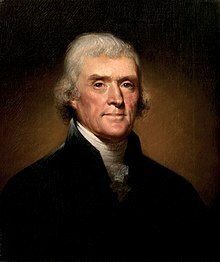 Notes on the State of Virginia (1781–1783) was a book written by Thomas Jefferson. Originally written in 1781, it was subsequently updated and enlarged in 1782–85 and anonymously published in Paris in 1785. It was the only book by Jefferson published during his lifetime. It was originally written in order to answer questions posed to Jefferson about Virginia by François Barbé-Marbois then the Secretary of the French Legation in Philadelphia. All the powers of government, legislative, executive, and judiciary, result to the legislative body. The concentrating these in the same hands is precisely the definition of despotic government. It will be no alleviation that these powers will be exercised by a plurality of hands, and not by a single one. [...] As little will it avail us that they are chosen by ourselves. An elective despotism was not the government we fought for; but one which should not only be founded on free principles, but in which the powers of government should be so divided and balanced among several bodies of magistracy, as that no one could transcend their legal limits, without being effectually checked and restrained by others. Comparing them by their faculties of memory, reason and imagination, it appears to me, that in memory they are equal to the whites; in reason much inferior, as I think one could scarcely be found capable of tracing and comprehending the investigations of Euclid; and that in imagination, they are dull, tasteless, and anomalous. The Indians, with no advantages of this kind, will often carve figures on their pipes not destitute of design and merit. They will crayon out an animal, a plant, or a country, so as to prove the existence of a germ in their minds which only wants cultivation. They astonish you with strokes of the most sublime oratory; such as prove their reason and sentiment strong, their imagination glowing and elevated. To emancipate all slaves born after passing the act. The bill reported by the revisors does not itself contain this proposition; but an amendment containing it was prepared, to be offered to the legislature whenever the bill should be taken up, and further directing, that they should continue with their parents to a certain age, then be brought up, at the public expence, to tillage, arts or sciences, according to their geniusses, till the females should be eighteen, and the males twenty-one years of age, when they should be colonized to such place as the circumstances of the time should render most proper, sending them out with arms, implements of houshold and of the handicraft arts, feeds, pairs of the useful domestic animals, &c. to declare them a free and independant people, and extend to them our alliance and protection, till they shall have acquired strength. It will probably be asked, 'Why not retain and incorporate the blacks into the state, and thus save the expense of supplying, by importation of white settlers, the vacancies they will leave?' Deep rooted prejudices entertained by the whites; ten thousand recollections, by the blacks, of the injuries they have sustained; new provocations; the real distinctions which nature has made; and many other circumstances, will divide us into parties, and produce convulsions which will probably never end but in the extermination of the one or the other race. Since at least 1997 the statement "Was the government to prescribe to us our medicine and diet, our bodies would be in such keeping as our souls are now" has been misquoted in paraphrased form as "If people let government decide what foods they eat and what medicines they take, their bodies will soon be in as sorry a state as are the souls of those who live under tyranny". The Newtonian principle of gravitation is now more firmly established, on the basis of reason, than it would be were the government to step in, and to make it an article of necessary faith. Reason and experiment have been indulged, and error has fled before them. Subject opinion to coercion: whom will you make your inquisitors? Fallible men; men governed by bad passions, by private as well as public reasons. Is uniformity attainable? Millions of innocent men, women and children, since the introduction of Christianity, have been burnt, tortured, fined, imprisoned: yet we have not advanced one inch towards uniformity. What has been the effect of coercion? To make one half the world fools, and the other half hypocrites. To support roguery and error all over the earth. Let us reflect that it is inhabited by a thousand millions of people. That these profess probably a thousand different systems of religion. That ours is but one of that thousand. That if there be but one right, and ours that one, we should wish to see the 999 wandering sects gathered into the fold of truth. But against such a majority we cannot effect this by force. Reason and persuasion are the only practicable instruments. To make way for these, free inquiry must be indulged; and how can we wish others to indulge it while we refuse it ourselves. But every state, says an inquisitor, has established some religion. "No two, say I, have established the same". Is this a proof of the infallibility of establishments? Our sister states of Pennsylvania and New York, however, have long subsisted without any establishment at all. For in a warm climate, no man will labour for himself who can make another labour for him. This is so true, that of the proprietors of slaves a very small proportion indeed are ever seen to labour. And can the liberties of a nation be thought secure when we have removed their only firm basis, a conviction in the minds of the people that these liberties are of the gift of God? That they are not to be violated but with his wrath? Indeed I tremble for my country when I reflect that God is just: that his justice cannot sleep for ever: that considering numbers, nature and natural means only, a revolution of the wheel of fortune, an exchange of situation, is among possible events: that it may become probable by supernatural interference! And with what execration should the statesman be loaded, who permitting one half the citizens thus to trample on the rights of the other, transforms those into despots, and these into enemies, destroys the morals of the one part, and the amor patriae of the other. Generally speaking, the proportion which the aggregate of the other classes of citizens bears in any state to that of its husbandmen is the proportion of its unsound to its healthy parts, and is a good enough barometer whereby to measure its degree of corruption.... Those who labor in the earth are the chosen people of God, if ever he had a chosen people, whose breasts He has made His peculiar deposit for substantial and genuine virtue. It should be our endeavour to cultivate the peace and friendship of every nation, even of that which has injured us most, when we shall have carried our point against her. Our interest will be to throw open the doors of commerce, and to knock off all its shackles, giving perfect freedom to all persons for the vent of whatever they may chuse to bring into our ports, and asking the same in theirs. Never was so much false arithmetic employed on any subject, as that which has been employed to persuade nations that it is their interest to go to war. The Works of Thomas Jefferson in Twelve Volumes, Federal Edition, Paul Leicester Ford, ed., New York: G. P. Putnam's Sons, 1904, Vol. 4, pp. 83.